Aluminum XLP USE Direct Burial. PVC Twist Sub Pump Cable No GD. 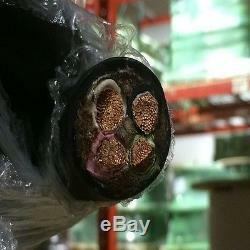 PVC Twist Sub Pump Cable W/G. Flat Neoprene Pump Cable W/G. Flat (2) JKT Pump Cable No GD. Flat (2) JKT Pump Cable W/G. 100' 6/4 SOOW Portable Power Cord Outdoor Durable Flexible Wire Cable 600V. Fully annealed stranded bare copper per ASTM B-174. Color coded 90° C EPDM. Temperature Range: -40° C to +90° C. Small motors and associated machinery. Excellent resistance to oil and moisture. Good tensile strength, elongation and aging characteristics. Picture May Not Represent Actual Cable and is Only Used as a Representation Please Refer to The Specifications for Product Accuracy. ASK US IF WE CAN DO BETTER ON THE PRICE. Signature required for all deliveries. Feedback will be left as soon as feedback is left for us. We have been in business for over 60 years and are family owned and operated. We have been on the inc 5000 in 2014, 2015, and 2016 as one of the fastest growing privately owned companies. We look forward to serving you. Some of our customers are shown below. The item "100' 6/4 SOOW Portable Power Cord Outdoor Durable Cable 600V Flexible Wire" is in sale since Thursday, October 20, 2011. This item is in the category "Business & Industrial\Electrical Equipment & Supplies\Wire, Cable & Conduit\Multiple Conductor Cable". 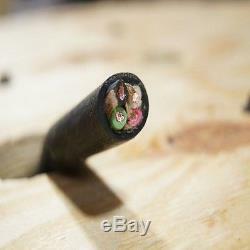 The seller is "bobdraper85" and is located in Millville, New Jersey. This item can be shipped worldwide.